When Frederick II in 1736 moved from Ruppin to the Rheinsberg Schloss his musicians of the “Ruppiner Kapelle” went with him. They were now his “Hofmusiker“. Quantz was still in Dresden in the service of Frederick Augustus II of Saxony (Augustus III of Poland) (1733 – 1763). He appreciated Quantz very much and increased his salary to 800 thaler and confirmed that Quantz could go to Frederick as often as necessary. 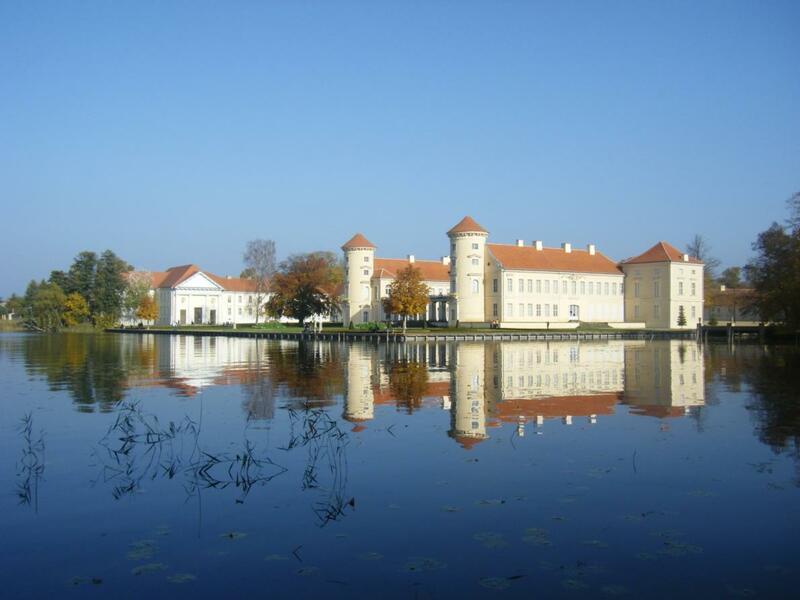 Quantz went twice a year to Rheinsberg to give lessons to the future king. The most of the musicians of Frederick II came from the outstanding Dresden Court Orchestra of August the Strong (1694 – 1733) and had been recommended to Frederick by Johann Joachim Quantz. The Dresdner Court Orchestra was led by the “complete concert master” Johann George Pisendel. At the time of Pisendel the orchestra was regarded as the foremost instrumental ensemble in all Europe. In Rheinsberg there were seventeen musicians. The musicians in the service of Frederick II in Rheinsberg were Johann Gottlieb Graun (concertmaster/violin), Franz Benda (violin), Georg Czarth (violin), Joseph Blume (violin), Johann Casper Grunke (violin), Ems (violin), Johann George Benda (viola), Antonius Hock (violoncello), Johann Gottlieb Janitsch (double-bass), Ernst Gottlieb Baron (lute), Petrini (harp), Joseph Ignatius Horgitzky (horn), a second horn player, whose name is unknown, Christoph Schaffrath (harpsichord), Michael Fredersdorff (flute) and finally Carl Heinrich Graun (singer: tenor, and violoncello) who became the “Kapellmeister” of Frederick II in Berlin. When oboist and fagottist were needed, for instance for the symphonies of Benda or Schaffrath, Frederick could fall back on the Ruppiner military musicians. Most biographers of Michel Blavet (1700 – 1768), the finest French flute player of his day, report that he visited the Crown Prince at Rheinsberg, probably in 1738, and was offered a permanent post, which he declined. Quantz had already encountered Blavet in Paris in 1726/1727 during his European journey and they became friends. In “Music at German Courts 1715 -1760. The Court of Brandenburg-Prussia. (2011)” Mary Oleskiewicz notes that a letter of 1737 of Frederick to Wilhelmine documents a visit of the principal flautist of Dresden, Pierre-Gabriel Buffardin, who was expected to arrive in Rheinsberg in the company of Carl Heinrich Graun. Reports of a visit in 1738 by another flautist, Michael Blavet, cannot be confirmed.“. For four years Rheinsberg experienced a flowering of preclassical music. As Frederick II in 1740 ascended to the throne the musicians moved with him to Berlin and formed the basis of his orchestra overthere.